Happy Brawlhallidays! Naughty or nice, we’re celebrating the season with festive new treats, like new Skins for Wu Shang and Artemis, a new Podium, a new Weapon Skin and lots more for those who want to get into the Brawlhalliday spirit. Dusk is also debuting for the first time on the free-to-play Legend Rotation and has his price reduced! We’ve sped up the loading times for all console versions of the game. Skyforged and Goldforged Orb also make their way into Mallhalla and can be purchased with hard-earned Glory. There’s also a balance pass, bonus login Gold for the Brawlhallidays event, game improvements, bug fixes, and so much more! Enjoy the patch and have a happy Brawlhallidays! To catch the latest Brawlhalla news and content, be sure to follow us on Twitter, Twitch, and YouTube! It’s the most wonderful time in Valhalla! Celebrate the Brawlhalliday cheer with new Skins for Wu Shang and Artemis, a new Podium, and a new winter-themed Weapon Skin for Katars. A Weapon Skin for Katars! These colors are sure to be a KO with their red, green, and white colors. Brawlhallidays will also feature snow on Maps, a UI Takeover and +250 Gold per login! Let it snow! Find Brawlhalliday items by following the snowflakes in Mallhalla! Exclusive Skins for Val, Bödvar, Kor, Cross, Ember, Teros, and Thatch. Dusk’s price has been reduced to 5400 gold! Skyforged and Goldforged Orb can now be purchased with hard-earned Glory. Brawl of the Week – Stay Frosty! Celebrate the holidays and get your Snowbrawl on at 150% damage! Face off against 3 other Legends in this 3 minute FFA. Score 1 point for hitting someone with a snowball, 3 points for getting a KO, and lose 1 point for being KO’d. Most points at the end wins! We made some changes to the way the console version of the game loads files and it should dramatically decrease startup times. While this won’t affect anything during gameplay, it should make it easier to hop into a brawl session whenever you want! Improved game launch times on all consoles. The animation of blowing a horn to summon a Sidekick is no longer interrupted by movement. Tournament mode bots now do the slow clap emote on the tournament bracket screen instead of the crying emote. Fixed texture resolution issues for the login bonus screen on consoles. Fixed a bug where the Hub could not be reached with a keyboard or controller while the Pause menu is open while spectating. Fixed bug that caused Apocalypse Mirage to not animate when holding a spear. Fixed a bug on Orb DownAir that could cause you to get the air version when mantling a ledge. Fixed a bug on Steam, Xbox One, and PS4 where the right stick would move instead of taunt if the “Improved Joysticks” option was unchecked. Steam PC-only: Fixed a bug where having -multikeyboard enabled could cause the game to crash during start-up in extremely rare cases. Fixed rare crash when getting mission descriptions. Fixed problems that could occur when resuming the game after Xbox One was asleep. Fixed a bug where the turn animation would not play while Fastfalling. Fixed bug on Nintendo Switch where the background was not showing up correctly on the Wheel test map. Throwing weapons, particularly from dashes and dash-jumps, could build damage too quickly over the course of a match. We have decreased the damage dealt by thrown weapons to bring them in line with their range and utility. Weapon Throw: Decreased Damage dealt by thrown Weapons by 20%. (Gadgets remain at their previous values). The Axe’s ground kit could often be difficult to strike stacked opponents, so we have shifted some power from the aerial kit to afford greater ease in use and coverage on the Neutral Light. Axe Neutral Light: Increased coverage near the user. Axe Down Air: Decreased Forced from 60 Fixed/35 Variable to 58 Fixed/34 Variable. We have increased the reward and ease of use on the Bow’s horizontal attacks, as it had fallen behind the edgeguard and stage control potential of other weapons with similar range. Bow Side Air: Increased Stun from 21 to 25; Slightly increased threat coverage near the user. Bow Side Light: Decreased Time to Hit from 11 to 10. The Blasters’ Recovery has proven to slightly outpace other strong knockout options in the game, so we have shifted some of that force into its low-powered, horizontal knockout potential. We have also increased the time to hit for the Down Light, given the increased versatility of its follow-up options. Blasters Recovery: Decreased Force from 52 Fixed/49 Variable to 52 Fixed/47 Variable. Blasters Down Light: Decreased Damage from 16 to 14; Increased Time to Hit from 8 to 9. Blasters Side Air: Increased Force from 49 Fixed/40 Variable to 49 Fixed/42 Variable. The Cannon’s on-stage game finds increased viability with safer use of its Down Light combo starter and greater knockout potential on its Neutral Air combo ender and anti-air. Cannon Down Light: Decreased Recover Time on miss from 2 Fixed/13 Variable to 0 Fixed/13 Variable. Cannon Neutral Air: Angle of knockback is now significantly more vertical. Cannon Down Air: Increased Damage from 15 to 16. The Gauntlets have had some of the speed and damage of their downward directed attacks reined in, while enhancing some of the more useful on-stage options. The Side Light has slightly increased priority to better combat close-ranged opponents, while the Neutral Air has slightly increased damage for more rewarding combos when bouncing opponents off the ground. Gauntlets Down Air: Decreased Damage from 17 to 15. Gauntlets Down Light: Decreased Damage from 14 to 13. Gauntlets Side Light: Slightly increased horizontal threat coverage at the beginning of the attack. Gauntlets Ground Pound: Increased Time to Hit from 14 to 17. Gauntlets Neutral Air: Increased Damage from 12 to 13. The Hammer has received increased threat coverage on its primary vertical attack to further lean into its large and heavy playstyle. The Neutral Light now has a more horizontal knockback angle, granting greater stage control when landing this attack. Hammer Neutral Air: Increased bottom coverage at the beginning of the swing; Decreased deadzone at the center of the swing. Hammer Neutral Light: Angle of knockback is now significantly more horizontal. We have increased the reliability of Katars’ main approach tools to compensate for their low range. The Down Air has increased Stun for tighter string capability, while the Side Light now does more damage even when connecting with the end of the attack. Katar Down Air: Increased Stun of the ground version from 11 to 12; Increased Stun of the air version from 13 to 14. Katar Side Light: Increased Damage from 11 to 13 and focused the majority of damage into the final hit; Increased maximum speed bonus from movement; Decreased Force from 33 Fixed/18 Variable to 35 Fixed/10 Variable. The Lance Down Light now fits its role better as a setup tool, as it leaves the opponent much closer after use. The stun has been decreased to keep the relative advantage the same, as it no longer requires dash or dodge startup time to get within striking distance. Lance Down Light: Decreased Stun from 23 to 21; Setup location is now closer to the user; Slightly increased maximum vertical threat coverage. The Orb receives its first round of adjustments, with decreased cooldown across its kit, Down Light receiving decreased force for more consistent strings at wider health ranges, and a new combo starter due to Side Light’s increased stun. The Down Air has also received reductions in time to hit and recover time for more fluid use, less gravity during its attack for safer use off-stage, and greater force and stun for increased reward to better match its complexity. Reduced Orb’s hitbox size when thrown to better match the weapon’s size; Increased Damage and Force when thrown to more closely align with other similarly sized weapons. Orb Down Light: Decreased Recover time on miss from 2 Fixed/20 Variable to 1 Fixed/18 Variable; Decreased Cooldown on miss from 16 to 10. Changed Force from 55 Fixed/30 Variable to 60 Fixed/15 Variable; Increased maximum speed bonus from movement; Knockback angle is now slightly more vertical. Orb Neutral Light: Decreased Cooldown on miss from 17 to 14; Decreased Cooldown on hit from 12 to 10. Orb Neutral Air: Decreased Cooldown on miss from 17 to 12; Decreased Cooldown on hit from 12 to 9. Orb Side Air: Decreased Cooldown on miss from 17 to 12; Decreased Cooldown on hit from 12 to 9. Increased Force from 55 Fixed/38 Variable to 55 Fixed/40 Variable. Orb Down Air: Decreased Cooldown on miss from 17 to 14; Decreased Cooldown on hit from 11 to 9; Decreased Recover time on ground bounce from 0 Fixed/20 Variable to 0 Fixed/18 Variable; Decreased Recover time on the handspring ground bounce version from 2 Fixed/18 Variable to 0 Fixed/18 Variable; Decreased Recover time on wall bounce from 1 Fixed/20 Variable to 0 Fixed/18 Variable; Increased Force of the ground and wall bounce versions from 50 Fixed/32 Variable to 50 Fixed/34 Variable. Decreased Time to Hit from 18 to 16; Decreased Recover time of the aerial ender from 23 Variable to 20 Variable; Increased Stun of the ground and wall versions from 22 to 26; Increased Stun of the aerial version from 25 to 26; Increased aerial mobility during later Recover Time; Decreased effect of gravity during the attack. Orb Ground Pound: Changed Force from 44 Fixed/50 Variable to 52 Fixed/45 Variable. As an overly strong weapon off-stage, the Scythe Ground Pound now has a weaker, more vertical angle of knockback to allow for more attempts at recovering against a Scythe user. We have also shifted some damage from its other powerful edgeguard tool, the Down Air, into its primary anti-air, the Neutral Light. Scythe Ground Pound: Decreased Force from 60 Fixed/33 Variable to 60 Fixed/31 Variable; Angle of knockback is now more vertical; Increased Minimum Charge Time from 11 to 13; Slightly decreased threat coverage at the top of the attack; Increased Recover time from 2 Fixed/17 Variable to 3 Fixed/17 Variable. Scythe Down Air: Decreased Damage from 15 to 14. Scythe Neutral Light: Increased damage from 12 to 13. We have shifted some power from the Spear’s rate of damage in combos that begin with the Down Light in favor of increased stun on the Recovery. This gives the Spear greater utility at the lower health ranges on its only true vertical aerial attack to help offset its lack of priority. Spear Down Light: Decreased Damage from 15 to 13. Spear Side Air: Decreased coverage at the top and rear of the attack. Spear Recovery: Increased Stun from 21 to 25. Given the Sword’s versatility in both vertical and horizontal directed attacks, we have decreased the force of the Side Air to bring its horizontal knockout power in line with similar options on the other medium-range weapons. Sword Side Air: Decreased Force from 67 Fixed/35 Variable to 60 Fixed/33 Variable; Angle of knockback is now slightly more horizontal. We have reduced the Unarmed Down Air’s threat coverage to enable armed players to better contest this attack off stage. Unarmed Down Air: Decreased threat coverage of attack at the foot. This round of balance brings more adjustments to Signatures that have either been under or over-performing, with several being altered to better match the stats of the Legend, such as the increased minimum charge time on Zariel’s Side Bow, and the decreased recover time on Cassidy’s Down Hammer. Dusk also has his first round of updates, with greater damage and force on his Down Orb. We have also increased the stun on Yumiko’s fire signatures, for increased combo potential on these unique setup tools. Mordex Down Gauntlets: Decreased Force from 60 Fixed/58 Variable to 60 Fixed/52 Variable; Increased Minimum Charge time from 12 to 14. Cross Neutral Blasters: Decreased Force from 75 Fixed/52 Variable to 65 Fixed/50 Variable. Cross Neutral Gauntlets: Increased Damage from 20 to 23. Kor Neutral Gauntlets: Increased Time to Hit from 15 to 17; No longer hits grounded opponents. Zariel Side Bow: Increased Minimum Charge time from 9 to 11. Zariel Side Gauntlets: Increased Damage from 21 to 22. Yumiko Down Hammer: Increased Stun of final hit from 8 to 13; Angle of final knockback is now more vertical. Yumiko Down Bow: Increased Stun from 20 to 23. Kaya Side Spear: Increased threat coverage of the initial stab. Kaya Neutral Spear: Increased grounded threat coverage at the forward base of the mammoth. Lin Fei Side Katar: Increased Force from 74 Fixed/50 Variable to 74 Fixed/54 Variable. Cassidy Down Hammer: Decreased Recover time from 25 to 21. Jiro Down Scythe: Decreased Minimum Charge time from 6 to 5; Increased threat coverage of the initial swing. Jiro Down Sword: Increased Force from 50 Fixed/46 Variable to 50 Fixed/50 Variable; Increased Damage from 18 to 22. Dusk Down Orb: Increased Force from 55 Fixed/35 Variable to 55 Fixed/44 Variable; Increased Damage from 21 to 24 and focused the damage more into the final hit. Dusk debuts on the new Legend rotation for the first time! 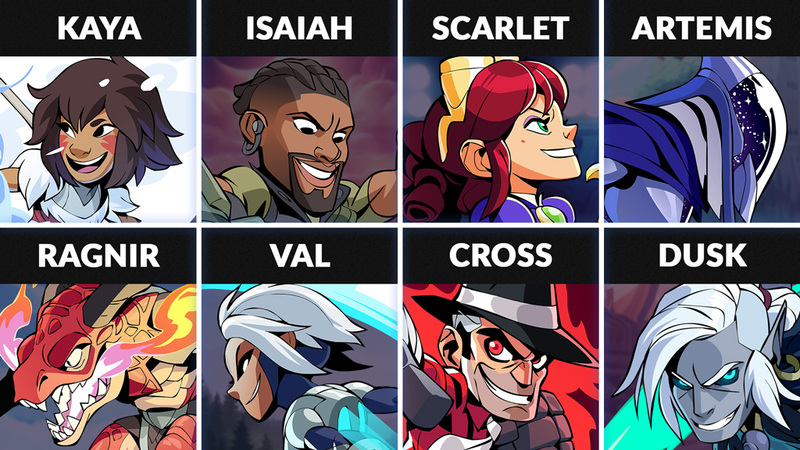 This week also includes: Kaya, Isaiah, Scarlet, Artemis, Ragnir, Val, and Cross.